Santa Monica Boulevard Charter School was using filing cabinets to separate one large multipurpose room into a technology center, storage area, office and one-on-one learning environment for special education students. 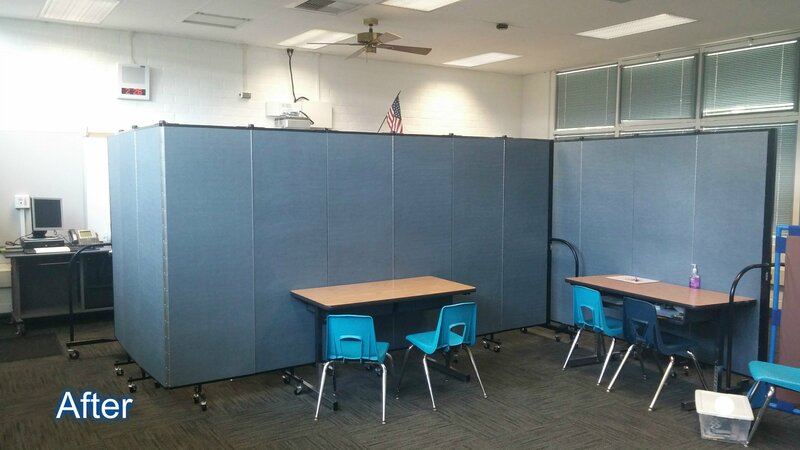 After a quick search on the internet, the school found an affordable and timely solution to their problem: Screenflex Portable Room Dividers. Like so many other schools in Southern California and across the nation, Santa Monica Boulevard Charter School was extremely cramped for space. Budget cuts and the demand for new programs force school administrators to do more with their space. Filing cabinets were used to separate one large multipurpose room into three distinctly separate, needed areas. But like so many other schools, Lee knew she would have to make the most of the space she had to work within the school. The charter simply could not afford any more classrooms, and even if it could, waiting was not an option. The school was expecting 1,500 students in the fall special education students would be without a private place where resource specialists could conduct speech therapy if she didn’t move fast. After a quick search on the internet for portable room dividers, Linda found Screenflex Portable Room Dividers, an Illinois-based manufacturer of versatile, portable dividers. The company offers online space planning as well as free information kits to help make the decision-making process easier for facilities managers and other district personnel. For about $10,000 Santa Monica Elementary School transformed it’s large 26 feet by 24 feet multipurpose room into four separate areas: one 9 by 13, one 15 by 13, and one 17 by 9 room, as well as a 7 by 9 storage area. The walls are 6 feet tall and include three doors, which help to create more private study and work areas, the mallard green color fabric blends in nicely within the school’s decor and surroundings. Screenflex designed the room dividers so that speech therapy could be conducted in one area, teachers could prepare lesson plans in another, and items could be stored in the remaining section. 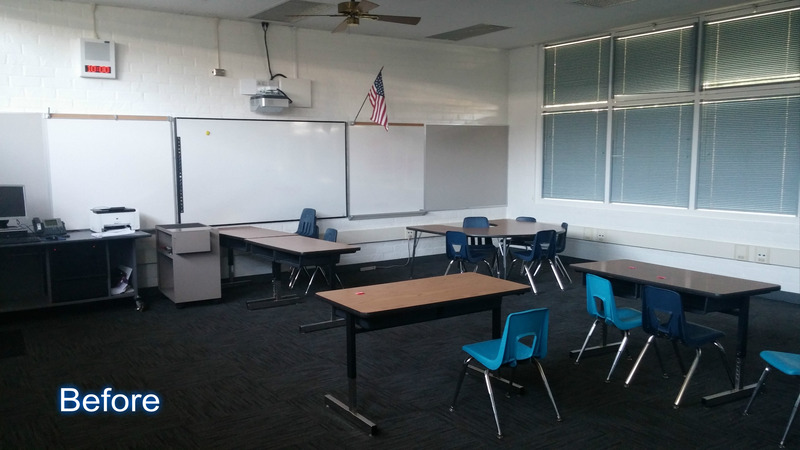 As the school needs change, the size and use of the new rooms can adapt as well. All of the dividers are on casters are easily wheeled away and stored in just minutes. They fold neatly and compactly, in an accordion style so that the large multipurpose room can still be used for assemblies, programs, or special events as often as necessary. As your needs change, you can open a room back up and you would never know the dividers were there. That is the beauty of portable room dividers. This versatility makes dividers an excellent alternative not only to conventional construction but to modular classrooms as well. nd vinyl finishes that are tackable and are conveniently used to display students’ artwork or papers. Room dividers are also readily available in six different heights: 4’, 5’, 6’, 6’-8”, 7’-4”, 8’ and lengths come in sizes from 5’-9” to 24’-1”. Furthermore, lock Screenflex’s patented Standard dividers together with an optional multi-unit connector to form unlimited lengths. End frames, full-length hinges, and partition controllers add unmatched stability over competitors. Doors, windows, dry-erase marker boards, and a variety of other features can be also be added to make your dividers more aesthetically pleasing and functional. Screenflex dividers are shipped by truck and most arrive already assembled. Additionally, light-duty, heavy-duty, and Wallmount dividers are available in a variety of heights, lengths, colors and price points. High schools, colleges, churches, hospitals and even sports teams use Screenflex Portable Room Dividers. They can transform a gymnasium into a Sunday school, a cafeteria into a study hall, or a conference room into a private meeting place. The hospitality, government and corporate markets use the popular divider to create training rooms, bulletin boards and sometimes just to hide “stuff”! The options are as endless as the imagination. There are really no limits to what you can do with them. For more information on Screenflex Room Dividers including a list of happy customers near you, or a free planning guide, visit Screenflex Portable Partitions on the web at www.screenflex.com or call (800) 553-0110.